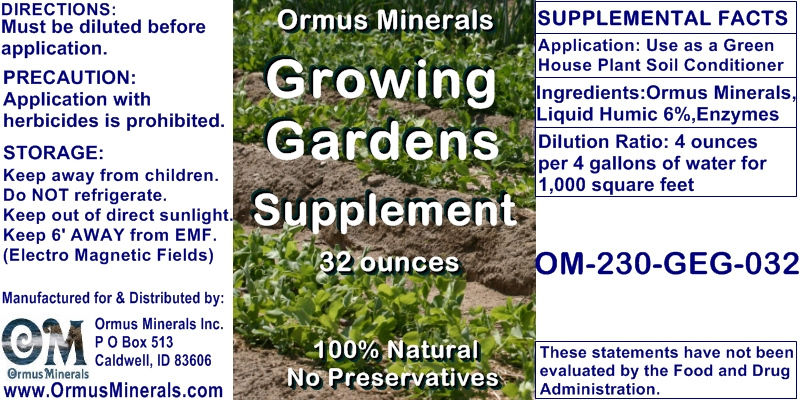 Garden Produce: Apply 1 to 2.5 gallons of Ormus Growing Gardens Supplement concentrate per acre. So the dilution rate would be 100 to 250 gallons of water mixed with this solution before application. gallons of water equals a 1% solution. About 2 tablespoons (one ounce) per gallon equals a ~0.9% solution. There is latitude either side of this value. Three tablespoons/1.5 ounces on the high side and one teaspoon/gallon on the low end works in nearly all situations. as the 32 ounce bottle will provide 64 gallons of Ormus water. If in an intensive operation, use twice to three times per crop.